what's the maximum scenery objects? Im making a warthog run where a place is destroying. Number of scenery instances? alot. Got tired of clicking add in guerilla after 1231 blocks. It's probably like 2048 max or something. No idea if there's a limit on how many can be drawn on screen at once, even if they happen to be all of 6 faces or not. I'd like to point out that if you are curious about a particular topic or feature do try and test whatever you hold your suspicions for, yourself before taking up the time of other users. It just seems silly to ask a question which you could easily debug on your own without the aid of another. That is unless you lack modding accomplishment. I don't know about vanilla but with OS I can place an obscene amount of scenery without hitting any kind of limit. However flickering will eventually begin. basically what he is saying is there there is no benefit to crowd source knowledge. Find it out on your own. I tend to disagree but whatever. Dennis sir I must proclaim your words towards me bring me distain! To clarify let me just say testing your self against this topic is complicated, but do not dismay. Simply duplicate an object a bunch of times and once you have reached the rendering peak report back here with your finds! why the use of to many scenerys? Big maps they are the trend today! Those smaller ones they can be so pass�. Note the amount of scenery objects that can be rendered at once is probably lower than the amount of scenery objects that can be placed on the map as a whole. 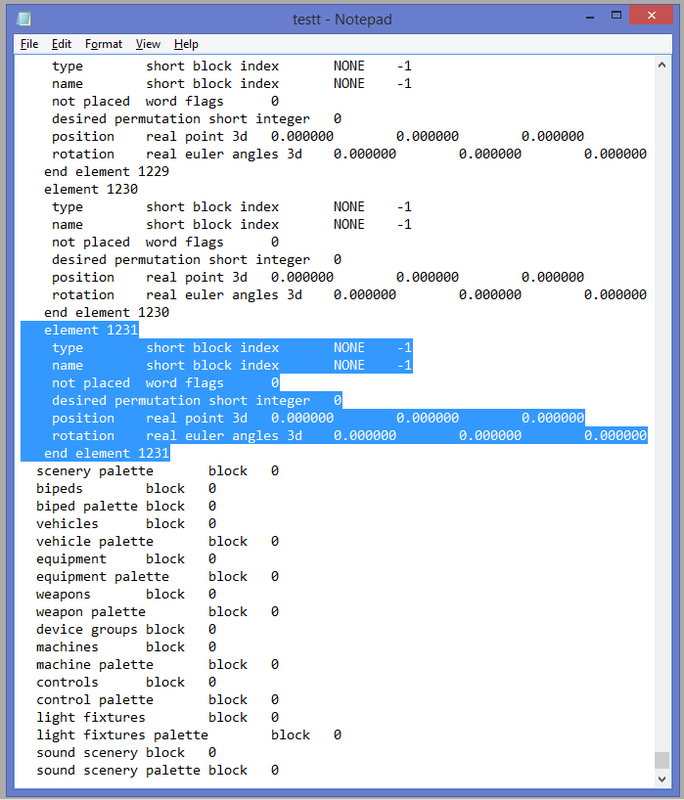 Default CE can render 256 objects at once, hac2 can render 1024 and opensauce too I think. By big I mean long. The general views are pretty small but there is a lot of BSP. Its good to be big and greater to be long for it gives a good impression, ask tark he cannot be wrong. I've hit that limit many times... I eventually just merged a bunch of objects together (For example, decorations in a room) into a single Scenery tag. Ended up being less demanding on resources. trouble is, you place too much in one BSP and while everything is still there not everything is visible all at once. I posted limits in the past. I'll try to dig them up. It is a juggling act between the terrain geometry, forming scenery and machines (like doors and elevators) to function within a specific area of that geometry (like a room, or a wall doorway entrance), and the numbers of duplicate instances of a kind of scenery. Basically, I recommend using a cyborg biped model as a reference size, making the level's terrain geometry first, then making the customized scenery and machines like doors specifically designed to fit the scale of that level, and then making or scaling existing scenery models to fit within your level. It's more work, but it lets you be more novel with everything. Values greater than 32768 are probably the maximum 32-bit signed integer value (over 2 billion) or otherwise the file size limitation of a 32-bit operating system or however much available memory your computer has. These values are listed as "n/a". Appreciate all of that sparky, that'll be useful for a lot of people. Not too long ago I wrote a script to track the value change in the player's z position in order to fine tune the gravity and jump velocity for double game speed. Like an idiot, I wrote the entire thing with over 200 global variables before ever compiling it. Managed to rewrite the thing to use just over 100, but I should've figured there would be a limit. That was fun. If anyone's interested, compile your map with gravity scale at 0.25495, and set your biped's jump velocity to 0.035. That's as close as I was willing to try to get. Would love it if we could get our hands on a foot print manager which could calculate the amount of a memory a specific feature such as a texture or animation is using ingame. Time: Wed April 24, 2019 1:03 AM 250 ms.